Rite Aid (NYSE: RAD) is a drugstore chain in the United States and a Fortune 500 company headquartered in East Pennsboro Township, Pennsylvania, near Camp Hill. It operates more than 4,780 stores in 31 states and the District of Columbia, features a strong presence on both the East and West Coasts, and employs approximately 109,000 associates. Rite Aid is the largest drugstore chain on the East Coast and the third largest drugstore chain in the U.S.
Rite Aid began in 1962 as a single store opened in Scranton, Pennsylvania called Thrif D Discount Center. After several years of growth, Rite Aid adopted its current name and debuted as a public company in 1968. Today, Rite Aid is publicly traded on the New York Stock Exchange under the ticker RAD. Rite Aid reported total sales of USD $24.3 billion in fiscal year 2008. In 2008, its market capitalization dropped to under $500 million. 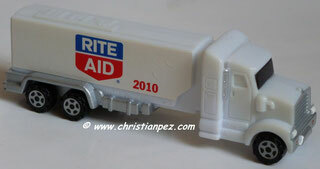 As of 25 February 2010 (2010 -02-25)[update], the market capitalization of Rite Aid was about $1.3 billion. Its major competitors are CVS and Walgreens.